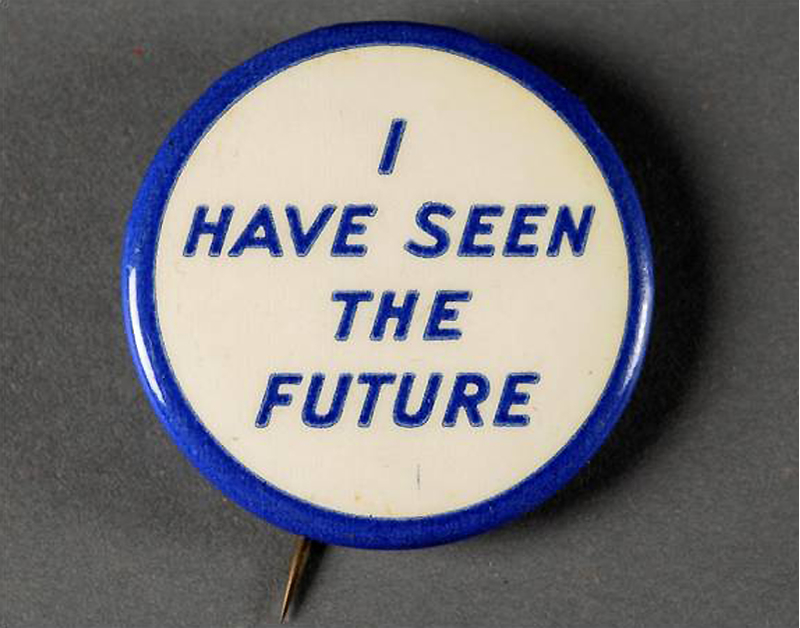 Unidentified photographer, pin given out at General Motors Futurama Exhibit, 1940. In September 2012, the Harry Ransom Center at the University of Texas at Austin launched a major exhibition of theater and industrial designer Norman Bel Geddes, whose papers are housed at the Center. 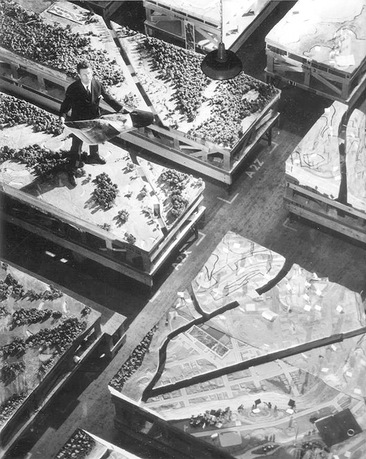 Entitled I Have Seen the Future: Norman Bel Geddes Designs America, the exhibition explores Bel Geddes's design philosophy and methodologies through approximately 50 projects. The exhibition also looks at the legacy of Bel Geddes on the American experience. The show is complemented by an exhibition catalogue and a companion web-exhibition and descriptive portfolio of all Bel Geddes's projects, which number more than 600. The book, edited by Donald Albrecht, exhibition curator, is organized into two parts: ten brief essays providing concrete descriptions of the key projects in the exhibition, and eight longer thematic essays interpreting Bel Geddes in the broader context of his social, cultural, and intellectual milieu. Cathy Henderson is the associate director for exhibitions and Fleur Cowles Executive Curator at the Ransom Center. Henderson received a BA in English from Allegheny College and a master's degree in library and information science from the University of Texas at Austin. She has held a number of positions at the Harry Ransom Center over a thirty-year career, including research librarian and associate librarian for manuscripts and public service. She has been in charge of the Center's exhibition program since 2001. She has served as lead or co-curator on a dozen exhibitions at the Ransom Center and provided management oversight for more than thirty additional in-house, traveling, and web exhibitions. The history of the Harry Ransom Center officially began in 1957, when vice-president and provost Harry Huntt Ransom founded what was then called the Humanities Research Center at the University of Texas at Austin. The central mission of the Ransom Center is to advance the study of the arts and humanities. To this end, the Center: Acquires original cultural material for the purposes of scholarship, education, and delight; Preserves and makes accessible these creations of our cultural heritage through the highest standards of cataloging, conservation, and collection management; Supports research through public services, symposia, publications, and fellowships; Provides education and enrichment for scholars, students, and the public at large through exhibitions, public performances, and lectures.